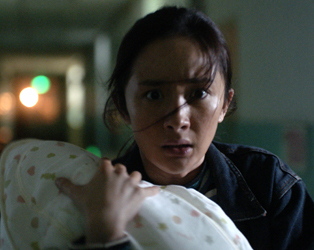 Jiang Meng (a stunning Yang Mi) is a foster child who, having reached the age of 18, must leave the family. Finding a job as a cleaner in a hospital, she encounters a newborn girl in critical condition, who has the same birth defect she herself had as an infant. With no certainty of survival, the parents have decided to refuse treatment and to allow the baby to die peacefully in a hospice. Meng though cannot accept the decision, and will stop at nothing to save the newborn girl who mirrors so closely who she once was. Executive-produced by Hou Hsiao-Hsien, this is a tough, fast-paced, social justice drama.